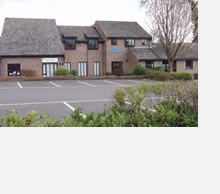 Index House is a modern office building situated close to The Square in the centre of Liphook. It is adjacent to Sainsburys and a variety of other shops and banks, and the railway station is 5 minutes walk. Liphook has excellent access to Guildford, London and Portsmouth via both the A3 and the main London Waterloo to Portsmouth railway line; travel time to Waterloo is approximately 1 hour. There is an on site car park for use by tenants. This is accessed from the adjacent Midhurst Road public car park, which provides free additional parking and can be used by visitors. The offices are on the First Floor of Index House, which was constructed about 25 years ago. As such, most of the office walls are of solid construction, providing excellent sound insulation from adjacent units. Entry to the ground floor reception area is gained via an access control and entry-phone system which is linked to all offices, with stairs leading directly to the First Floor. The offices are also protected by a NACOSS approved, RedCare monitored alarm system. All units benefit from Cat 2 lighting. Units are let on a simple lease (subject to contract), which excludes sections 24-26 of the Landlord and Tenant Act 1954. Tenants may vacate after six months or any subsequent month having given three months’ notice, and rent is reviewed annually with any increase limited by the current RPI. The rent includes, water rates, electricity, cleaning, waste disposal, security system, fire safety checks and routines, decoration & re-decoration, internal & external maintenance, and the joint use of common entrance, kitchen and toilet facilities. Payments are due monthly in advance by standing order, with a deposit held equivalent to one month’s inclusive rent; this is refundable on termination. Please note that there is NO VAT to pay on the rents at Index House. Insurance for the building, loss of rent and employer’s liability in relation to staff and agents of the owner are included in your rent but your own contents, consequential loss, employer’s liability and other insurance risks remain your own responsibility. We provide space managed for short to medium term occupation. Consequently availability changes frequently as businesses grow and contract within our buildings. Please contact us for current availability.